Heatstroke, also known as heat exhaustion or hyperthermia, occurs when there is an increase in the body’s core temperature caused by an inability to dissipate or expel heat from the body. Dogs are unable to cool their bodies by sweating and can only pant and drink water to help reduce their body temperature. This is not very effective so a dog can easily overheat. If your pet is showing signs of heatstroke call a vet immediately. If not treated promptly heatstroke is fatal. Heatstroke often progresses very quickly, and a dog can go from appearing ok to unconscious within 30 minutes. For this reason, if your pet is showing any symptoms, treat it as a medical emergency and contact your vet immediately. If a dog can no longer regulate his body temperature through panting or drinking, heatstroke will follow. All dogs are venerable to heatstroke during the summer months particularly following exercise in direct sunlight, or by being shut in a car, shed or other enclosed space where the temperature is hot and there is little fresh air. If your dog is out during a sunny day it is essential they have access to shade and plenty of water. What puts a dog at risk heatstroke? Dogs who are overweight or have thick, dark coats are particularly susceptible, as are breeds with a predisposition to respiratory problems, such as Pugs, Bulldogs, Boston Terriers, Boxers, Pekingese, Cavalier King Charles Spaniels. If your dog has an existing heart or lung condition, they are also at a greater risk. If you suspect heatstroke, immediately remove the dog from the hot area. Wet him with cool water (luke warm for small dogs), offer water to drink and, if available, place him in front of a fan. If not already done, urgently call a vet. Never use very cold or ice water as this can cool the dog’s body temperature too quickly, causing additional complications. Your dog’s symptoms and recent history will assist the vet in diagnosing heatstroke. 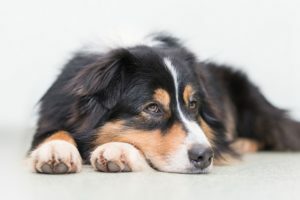 Your vet will undertake a physical examination of your dog, including taking their temperature, assessing coordination, and undertaking blood tests and urinalysis. What treatments are there for heatstroke? The vet will use controlled methods to reduce your pet’s body temperature such as placing the dog on a wet towel, wetting paws and fur and placing him in front of a fan. During this process your dog’s body temperature will be monitored as will any signs of complications such as shock, kidney failure and heart abnormalities. He is also likely to be given intravenous fluids and medication to help restore function, or reduce the risk of damage, to major organs. If your dog receives treatment early enough the prognosis can be good. He will, however, need hospitalisation for 24-48 hours until he is well enough to be sent home. If a dog recovers from heatstroke they are unlikely to suffer long term side effects but may be more susceptible to heatstroke in the future. Where a dog has suffered severe heatstroke, it is likely to have caused organ damage which may need ongoing care. Unfortunately, where treatment has been delayed the prognosis is poor and heatstroke can be fatal. Be aware of your dog’s ability, or lack of ability to keep cool. If they suffer with pre-existing conditions like obesity, old age, heart disease or breathing problems you will need to take more care to keep them cool and hydrated. All dogs should be provided with access to water and on sunny days, access to shade should be available to them at all times. Never leave your dog in a hot parked car, even if it is placed in the shade. On hot days, restrict exercise and walk them when it is cooler in the mornings and/or evenings. Do not muzzle your dog in warm weather as this restricts the ability to pant and keep cool. On hot days, wet your dogs fur to keep him cool, or provide him with a wet towel to lie on. Flat ice packs wrapped in a towel and placed on the floor for them to lay on can also help. If your dog has a long or thick coat, consider getting them clipped during the summer months to help keep them cool.